It's here. Finally. I watched it coming for weeks it seems, the first leaves starting to burst with darkening color, the pumpkins starting into stores. But. It never truly hits like the calendar turning over to October 1st. Over the last few weeks, I've been doing as much as I can to help get me into the seasonal mood. Two weeks ago, I was fortunate enough to make it out to Hurd Orchards in Holley, NY; an apple orchard, that also has a pumpkin patch. Apple picking, pumpkins, bales of hay, hot cider with a delicious lunch in the barn-- autumn came hurtling toward me, in every wonderful way. The orchard is run by a mother and a daughter, and the smaller, intimate feel goes such a long way. I had never been apple picking before, and it surely will not be the last time. 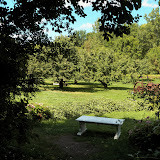 I could stand in that orchard, eating apples (and the apple jelly we had for lunch)-- forever. No exaggeration. I also probably could take photos of their pumpkins and orchards and barns in all their autumnal goodness forever, as well. Mums beginning to bloom, bright orange pumpkins fresh from picking, taking an apple off the tree and placing it in a barrel. On the way back from the orchards, we took a turn into an older cemetery, and as we were turing around, we realized the cemetery went farther than we thought: right into the beginning of some woods. Areas of older stones from the earlier 1800's lay on ridges down a path of trees-- and was quite the sight to behold. I took a couple of photos, but would love to go back there when I have more time-- and all I was able to catch were just glimpses of so many stones, and a whole new cemetery world to explore. Yes, autumn is underway and now it is October. So much to be done before Halloween, so much that will happen now, again- all at once.